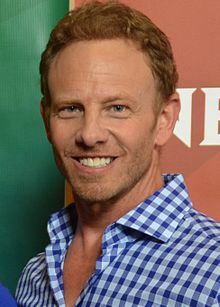 Ian Andrew Ziering (/ËˆaÉªÉ™n ËˆzÉªÉ™rÉªÅ‹/; born March 30, 1964) is an American actor and voice actor best known for his role as Steve Sanders on the television series Beverly Hills, 90210, which he played from 1990 to 2000. He is also the voice of Vinnie on Biker Mice from Mars. Since 2013, he has starred as Fin Shepard in the Sharknado film series.